Our Camo Survival/Rescue Knife features detachable mini flashlight and flint and creates exciting Giveaways with your logo. 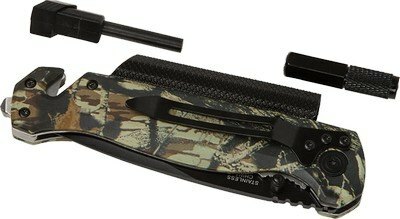 Get all your odd jobs done faster with the multi-purpose Camo Surival/Rescue Knife! 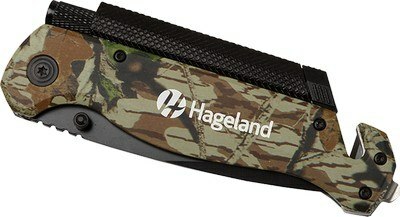 Print your company logo on this attractive camo design knife and help your recipients fend off attackers while getting to know about your brand. This knife features a lightweight stainless steel blade that is two stage with straight and serrated action. It also comes with a seatbelt cutter and window hammer for quick extraction. Along with this, it has a removable miniature sized flashlight with magnet and a flint for manual fire starting. It features a pocket clip and nylon pouch for ease of storage and carrying.